For the first time in the last five NBA seasons, Damian Lillard wasn’t worried about being All-Star snubbed. While he didn’t go so far as to assume he’d be named to the 2019 NBA All-Star Team, he also wasn’t sweating the Thursday’s announcement either. Which, often times, is when good things happen. While Lillard himself might not have necessarily expected he’d be named to his fourth NBA All-Star Game Thursday night, almost everyone who covers the NBA did. And they were ultimately proved correct, with Lillard joining Russell Westbrook, Anthony Davis, Nikola Jokic, Klay Thompson, LaMarcus Aldridge and Karl-Anthony Towns as a 2019 Western Conference All-Star reserve via a vote of the NBA’s coaches. Lillard now joins Clyde Drexler (eight), LaMarcus Aldridge (four) and Sidney Wicks (four) as the only players in franchise history to be selected as an All-Star at least four times. Between averaging 26.4 points, 4.6 rebounds, 6.3 assists and 1.08 steal and the Trail Blazers currently sitting in fourth place in the Western Conference standings, Lillard's selection for the 2019 All-Star Game, scheduled for February 17 at the Spectrum Center in Charlotte, NC, was all but a lock. "I've kind of managed games and managed the season so far and and I've paid attention more to how other guys can do more and how I can help them do more," said Lillard. "I think that says something as far as the impact." But you could have made a similar case last season as well, yet there was hardly a consensus that Lillard would make the 2018 team, even if he eventually did. Perhaps after six-plus seasons of defying expectations and doing things few in franchise history had done before, the league has finally accepted that Damian Lillard is one of the premiere guards in a league that has never boasted more talent at the position. His status as a leader, game manager and a force of nature on offense is no longer in question. 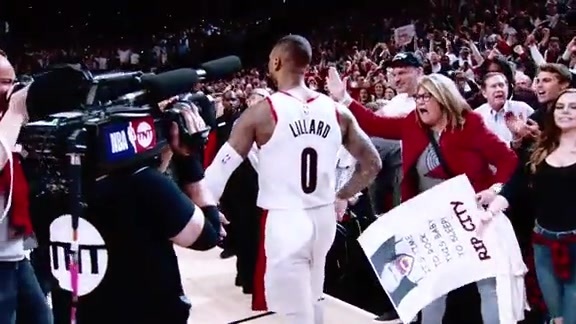 "I'm just controlling what's happening,"said Lillard. "Maybe last year I did that a lot of the time, but this year it's been there. I don't feel like I've had a bad stretch." With his ticket to Charlotte punched, Lillard now need only wait to find out if he's "draft" by LeBron James or Giannis Antetokounmpo, who get to pick their teams thanks to be the top vote-getters from their respective conferences. That draft will be televised on Thursday, February 7 on TNT.